On Christmas Eve at Amritapuri, Amma joined Her children in the darshan hall for an evening programme featuring dancer Nandini Venkat performing South Indian classical bharata natyam depicting nava rasa (nine moods). The dance was preceded by a musical performance by several of Amma’s western children, included traditional Christmas carols in Italian and Latin, including the beautiful hymn Veni Signore Jesu sung in choir, and an operatic arya entitled “Messiah” by Handel, performed solo by the ashram’s resident opera singer. One delightful highlight of the evening occurred when Tejas, an elderly but robust renounciate from France, appeared as a convincing Santa Claus. Amma had asked him to dress the part, but no one quite expected such an elaborate effort, replete with ringing bell and burlap sack of presents on his back! After the program, Amma distributed Christmas cake to all Her Western children, drawing each close for a kiss on the cheek or forehead and a smile or an affectionate word or two. Some of Amma’s children from the West might have been feeling homesick, pining for a traditional dinner and a fireside evening with family. By the end of the evening, however, all must have been more than satisfied, having spent a relaxed, sweet evening with their much larger spiritual family and their beloved Amma: Mother, Guru, and even Santa Claus, all rolled into one. Just before Christmas, Mother gave darshan to about 15,000 people a day in Calicut in northern Kerala, virtually around the clock for four days and nights. The programme ended early in the morning on December 24th. Without getting any rest after that marathon, Mother got into the car for the day-long journey back to Amritapuri. The next morning, she joined her children for a Christmas Day gathering in the temple. Mother sat on her cot, as she does several mornings a week for satsang-but something was different this time: beside her someone had placed a small, brightly decorated Christmas tree and a little angel doll! Near the end of the discussion, one of the Indian ashramites, who was once a Christian nun, spoke about Amma, saying that Amma herself is a living example of the self-sacrifice and compassion that Jesus taught and demonstrated in his life and death. Mother laughed in a self-effacing, innocent way. She said that she simply wants to serve everyone. Mother often sings a bhajan expressing her desire to be “the servant of the servants of God.” Jesus said, “What you do for the least of these, you do for me.” Amma says that to truly love her is to see the Divine in every being and to be loving and compassionate towards all. These eternal Truths, reflected in all spiritual traditions, emerged with a special beauty and clarity during this Christmas morning in Amritapuri. India may be primarily a Hindu nation, but one of the marks of Hinduism is its understanding that God, who has created so many different types of people, has also provided them with many different paths. So it is no great wonder that in a small village in South Kerala, “Silent Night, Holy Night” and “Angels We Have Heard on High” were heard ringing out over the palms swaying gently in the Arabian Sea breeze on Christmas night. Mother smiled softly, listening to the Christmas carols sung by the Western ashramites and several hundred visitors from all over the world. A Christmas play about the birth of Christ provided great delight and moments of laughter (with Mother practically leaping from her chair in delight from time to time): For example, one little angel found himself still out on the apron of the stage after the great doors rolled shut, and he struggled there, tiny as he was, trying to pry them apart and slip back inside! After the programme huge trays of Christmas cake were carried into the temple. Mother asked how many pieces there were: “Two thousand,” came the answer. “Western children, come!” She called out, and all those for whom Christmas was a long tradition were the first to receive the prasad from her hands. Plenty of the cake remained, and everyone present received a piece directly from Mother. I don’t think there is any difference between Christ and Amma. For me, God is infinite and his manifestations are also infinite. And God is not a miser, he is not a repetitive bore. Therefore, if we expect a Christ with a cross, a Krishna with a flute in our midst, we will be disappointed; because Christ is here in the form of Amma, Krishna is here in the form of Amma and Buddha is here in the form of Amma. So living with Amma, falling in love with Amma, is Christmas. This IS Christmas. For several years, Mother and her tour group have stopped at a river on route to Mother’s yearly programme in Calicut, where they have meditated, had lunch, shared satsang and bathed in the water made sacred by Amma’s presence. This year they did the same – but something was exceptionally different. In the past, a few devotees have had the good fortune of being at the river when Mother arrived. This year, there were more than a few: a crowd of several hundred had gathered, and the river visit could almost be said to have become another tour programme! Seeing so many hot and hungry people gathered there in the afternoon sun, Mother called out, “Have you eaten, children?” Most had not, and Mother proceeded to serve lunch not only to those travelling with her, but also to the many devotees. The kitchen crew was concerned that there wasn’t even enough food for the people travelling with Mother; but Mother, serving every plate of food herself, somehow managed to feed not only the tour group but all of the devotees who had gathered as well. After lunch, a few of the visitors joined Amma in the water: fully clothed, they waded into the river and made their way close to Mother. What a blessing to chant the Gayatri mantra and sing bhajans in the river with Mother! Afterwards, there were still so many devotees waiting for a glimpse of Mother that they formed a line (two or three people deep) stretching all the way from the water’s edge to Mother’s car – perhaps 200 metres. Along this line Mother moved slowly, caressing cheeks, listening to woes, smiling delightedly at people’s words of joy, kissing babies, and placing in each outstretched hand a packet of prasad: a sweet and a packet of vibhuti (sacred ash). With the aid of police vehicles, a path was cleared through the thronging crowd, and Mother’s car slowly made its way up the rocky road. Even then, devotees ran alongside, reaching out to touch the window against which Amma’s hand was pressed in loving benediction. In 1998, Amrita Institute has established the first filmless hospital in Southeast Asia. All radiology images are stored in a computer image archive and are available, within minutes, on any of the computers conveniently located throughout the hospital. Amrita digital equipment includes: Spiral CT Scanner, Radio Fluoroscopy with Digital Subtraction Angiography, Colour Doppler High-Resolution Ultrasound Scanner Ultrasound Tomography, Magnetic Resonance Image Scanner (MRI), and Gamma Camera with a wide variety of isotope scanning capabilities. The Medical Imaging Centre is one of the finest international centres of its kind. New high performance equipment together with a hospital-wide, all digital, imaging, archival and retrieval system establishes Amrita as an important referral site. Procedures using imaging equipment for guidance (Interventional Radiology) reduce hospital stays and costs, reduce the need for major surgery, and can save lives. Hundreds of patients have benefited from interventional procedures like guided biopsy, abscess drainage, nephrostomy, angioplasty, and embolizations. The ashram grew around Amma’s childhood home. It was a modest house with 3 rooms and a kitchen. It is built on the site of the original thatched hut, where Amma was born. When Amma first started Krishna Bhava beside the beach road, Her father became very anxious for Her safety. Adjoining his house was the family’s cowshed. He made space for Amma to give the Bhava darshans there. 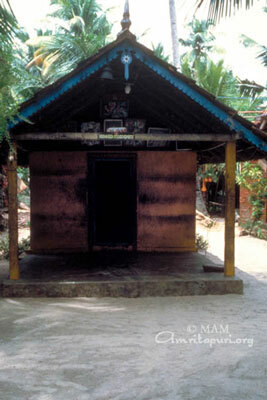 That cowshed was eventually converted into a temple (Kalari), which still adjoins the house and is used for pujas. The ashram started when the first three disciples asked Amma’s father if they could stay with Her permanently. He gave them a space on the backwaters near the Kalari. Using mud and sand as landfill, they reclaimed the land, and built a small palm leaf hut. The construction of the main temple started in 1985. In those days, all the disciples helped with the construction, especially the concreting work. Often Amma would lead the work shifts. Above the central entrance stands a majestic statue of Lord Krishna driving the chariot of Arjuna during the Mahabharata War. Lord Krishna gave the teachings of the Bhagavad Gita at the outset of the war. The temple’s inner shrine is dedicated to the Goddess Kali who is the symbolic destroyer of negative tendencies. God is not on a golden throne somewhere beyond the sky. He is pure experience. He is beyond the reach of the intellect and the senses. Still, we can perceive Him and we can know Him if we have shradda (faith and alertness). God’s consciousness pervades everything. His consciousness is immanent in the cawing crow, the crying cuckoo, the roaring lion and the raging ocean. God’s consciousness is the power that works through our hands, walks with our legs, speaks with our tongues, sees through our eyes and pulsates in our hearts. Children, God doesn’t have any hands or feet of His own. He works through us, through our eyes, ears and hands. So we have to bring him into our hands, into our feet, into our tongue, our eyes and our hearts. We ourselves have to become God. There are only two aspects of life: performing actions and reaping the fruits of those actions. If good actions bring good results, then bad actions bring bad results. My children need not be frightened when they hear this. Remember that if you take one step towards God, He will take 10 steps towards you. Students who come from remote villages, and who do not have the proper facilities to study, are often given special concessions during examinations. Those who have scored a certain minimum amount of marks are given moderation, so that they are able to pass the examinations. For example, if one has to have 40 marks to pass, these students can pass by getting only 25 marks. Similarly, if there is a minimum of effort on our part, God’s grace will descend upon us. More than our own effort, it is the grace of God that brings success in life. It is His grace that adds sweetness to the fruits of our efforts. Even if we do make an effort, we should be alert and try to eliminate egoism within us. Only then will we be fit enough to receive God’s grace. If we are proud and egoistic, then, even if God does shower His grace upon us, it will all be in vain. A lot of people apply for different jobs. After a written test, the successful candidates are called for an interview. A lot of these candidates are qualified in every aspect. Some of them may answer all the questions they are given exceedingly well, but not all of them are selected for the post. This is because they lack the grace that would melt the interviewer’s heart and make him pleased with them. If we are to receive that grace, we have to perform good, selfless actions. But most people try to gain things the easy way. In other words, God’s grace doesn’t come that easily. We cannot fool him in any way. He is not a dullard. God is the Supreme Intelligence — the source of all intelligence in the universe. We should always remember this and perform good actions, so that we will become worthy of receiving his grace. This is the easiest way to achieve success in life. Whenever you perform an action, you should listen to the voice of your conscience. If you ignore that voice and act contrary to what it tells you, it will make you restless and troubled. It will only lead to your ruin. Amma always says that meditation is as precious as gold. Meditation leads to material progress, abiding peace and ultimate liberation. Not even a moment devoted to meditation goes to waste, rather it beings 10-fold gain. And if, along with our meditation we develop compassion, it is like gold with a fragrance, something priceless and utterly unique. A smiling face, a kind word, a compassionate look — all these are different forms of meditation. Even the smallest word from us is of great importance. So we should utter each word with utmost attention. We shouldn’t say a single word that could hurt anyone. For what we give, we will receive. If we give sorrow to others, then we will also be given sorrow; and if we are loving towards others and make them happy, then we, in our turn, will receive love and happiness. A group of people lost their way on a journey. They met a man on the road and asked him the way. But they asked him rudely, “Hey, you! Tell us the way to such and such place!” The man was offended by their rudeness and thought, “How arrogant they are! I will teach them a lesson.” And so he deliberately gave them the wrong directions. If they had asked him politely, he would have tried to help them. And even if he didn’t know the way, he would have introduced them to someone else who knew the way. So it is our attitude that is responsible for the kind of response we get from others. If you speak to someone with love and humility, they will respond in the same way. So let your every word be spoken with utmost attention. There was a man who was looking for a job. He went to a company and pleaded with the owner: “I am a poor man. I do not have any way to support myself. Please won’t you give me a job!” But the owner scolded him and threw him out. The man went to another place. But there he was also turned away. Suppose he meets with the same experience at 10 places. He will lose all interest in life and he may try to commit suicide. On the other hand, if just one person says, “Please forgive me. At present there is no work available. But as soon as anything comes up, I will certainly let you know,” it will make such a difference to him. Those loving words will save him from the jaws of death. So children, we should make it a point that our every thought, word and deed are filled with love. Then God’s grace will spontaneously flow to us. To pray with absolute sincerity, “O God, don’t let my thoughts, words or deeds hurt anyone” — that is true devotion and true knowledge, and it is our duty to God. Just as the sun doesn’t need the light of a candle, God doesn’t require anything from us. All He expects from us is a compassionate heart. We should be able to reach out to the suffering and do all we can to bring peace into their lives. That is what God wants from us. It is the love and compassion we extend to those who are suffering that makes us fit to receive God’s grace. Amma wouldn’t say that the institutions of the math have come into being because of any merit on Amma’s part. It is because of you, my children, that we are able to do a bit of service. Thousands of Amma’s children are toiling day and night, without receiving any remuneration for their work. Amma’s children contributed whatever little they were capable of doing. In the beginning they made some mistakes, but because of the encouragement they were given, instead of losing hope, they worked with renewed vigor and by the grace of the Divine everything came off very well. So let us extend the same encouragement to those who have failed in life, and let us give them a chance to make an effort with renewed hope and enthusiasm. Thus we can uplift then and lead them also to the world of the victorious. It is said that there are 330 million1 gods shining throughout the temples and epics of Bharat. They take the form of men, women, animals and man-animals. They regularly come down from their heavenly kingdoms to interact with man, fulfill his prayers and uplift him spiritually. India’s Puranas tell tales of these gods competing with another, making families with one another and even giving birth to each other. To read the exploits of all of India’s gods could easily take one a lifetime. For not only are there the 18 Maha-Puranas and 18 Minor Puranas, but in addition to these practically every village in India has legends about the time, say, Lord Vishnu or a given mahatma deemed it fit for one of their divine plays. According to India’s scriptures and mahatmas like Amma, God, in truth, is the eternal, all-pervading consciousness. In fact, to have God’s darshan in the ultimate sense is to come to identify with that consciousness as it illuminates both thought and the absence of thought. This consciousness is the ultimate reality of God, of the universe and of our very Self. But just as H2O can take the form of vapor, water or ice, so too can the supreme consciousness assume any form. The common man needs a human face to tell his sorrows and joys, to worship with all his heart, to meditate upon and dedicate all his actions. Through this finite and localized symbol, he can touch, the infinite and all-pervading. In this way, man can both unburdened himself and be uplifted. Consciousness has no limits. It can take any form. For proof, just look around you. According to the saints and sages, the very computer screen you see before you is nothing but solidified consciousness. To please 330 million people, God will gladly take 330 million different forms. What is your taste? How do you like your God? Man? Woman? Child? Animal? The element of water, earth or space? In India, the Lord aims to please. As to what is fact and what is myth, it is impossible to truly say. Regardless, even the legends that were created out of the imaginations of the Saints and Sages have had their intended effect on humanity. Many stories were created to serve a given social purpose or to explain a certain principle. This was the intent of the storie’s authors from the beginning. Each year, as Amma travels across India as part of her Bharata Yatra, Amma herself adds to the country’s legends. Already villagers speak about the time “Mataji stopped and gave darshan” or the time “Amma came and sang bhajans”… in this field… by this river… in this truck stop… in this coal factory… Already villages have been renamed “Amrita Kupam,” “Amritamayi Nagar” and “Amritapur,” etc.4 From now on, as Amma travels the width and breath of Bharat, not only will we report on the “Sthala Puranas in-the-making,” but also on the ones millennia old. 1 The figure 330 million is stated in numerous Puranas. It is said that there are also an equal amount of demons. Perhaps that was the population at the time the Puranas were written. Now, as the population has grown, the number of gods and demons should be at least 10 times that, in order to reflect the subtle likes and dislikes of each man, woman and child. 2 Literally meaning “cow’s ear,” Gokarna is the place in Karnataka where the demon Ravana was tricked out of a sacred Shiva Linga by Lord Ganesha. The lingam became fixed to the ground there, and Ravana, in his anger, tried to uproot it, but only succeeded in deforming it into the shape of a cow’s ear. 3 When Sri Krishna’s kingdom of Dwaraka started sinking after Krishna’s maha-samadhi, Guru and Vayu Deva (the Guru of the devas and the God of Wind) rescued an idol of Krishna and installed it in this central Kerala city). 4 The three villages that the Ashram reconstructed after the 2001 Bhuj earthquake—Mokhana, Dagara and Modsar—were renamed by their village chiefs as “Amritapur,” “Amritamayi Nagar” and “Amrita Nagar,” and Samanthempettai, a Tamil Nadu village reconstructed by the Ashram after the 2004 tsunami was renamed as “Amrita Kupam,” by its people. Devi Bhava darshan took place in the new outdoor auditorium for the first time. The temple, which has been used since March 1993, is no longer large enough to accommodate the thousands who flock to Amritapuri on Devi Bhava days. The new auditorium, which covers 40,000 square feet (3,600 square metres) and has no supporting pillars in the middle, is the largest of its kind in South India. Because the hall is without pillars, devotees can watch the Devi Bhava darshan with an unobstructed view. During the Devi Bhava, television screens were set up throughout the hall, allowing even those furthest away to have a close-up view of Mother. Amma entered the hall just before 4:45 p.m. Before she stepped into the auditorium proper, she humbly reached down and touched the floor and then touched her hands to her head. At the start of her satsang, Amma asked everyone present to bless the new hall and pray that all who come there will experience peace and happiness. During the Devi Bhava, Amma tirelessly received more than 8,000 of her children. Around 8:00 a.m., fifteen hours after entering the hall, as the darshan queue seemed to be coming to a close, Amma unexpectedly called the computer students for darshan. What a surprise blessing for those already wearing their school uniforms and about to leave for their classes at the computer institute across the backwaters! The students were visibly moved and deeply touched by Amma’s love for them. The Devi Bhava came to a close just after 9:00 a.m., with 50 annaprasam (feeding baby with first solid food), three weddings and a pada puja (the ceremonial worship of the Guru’s Feet). Just after the Devi Bhava, Amma announced that she was going to start using the auditorium for bhajans every evening as well. Once a month, a special two-hour puja is performed in the original little temple at the ashram, in honour of Karthika, the day of Mother’s birth star. This month, on the auspicious day, the ashram was decorated more beautifully than ever. Throughout the grounds hundreds of oil lamps were lit and garlands were hung; the trees were filled with multicoloured lights. An atmosphere of celebration and festivity filled the air. Residents, visitors and 500 computer students from Mother’s Coimbatore campus enthusiastically participated in the bhajans that were sung during the puja. The singing was so high-spirited that it drew people from the dinner queue!